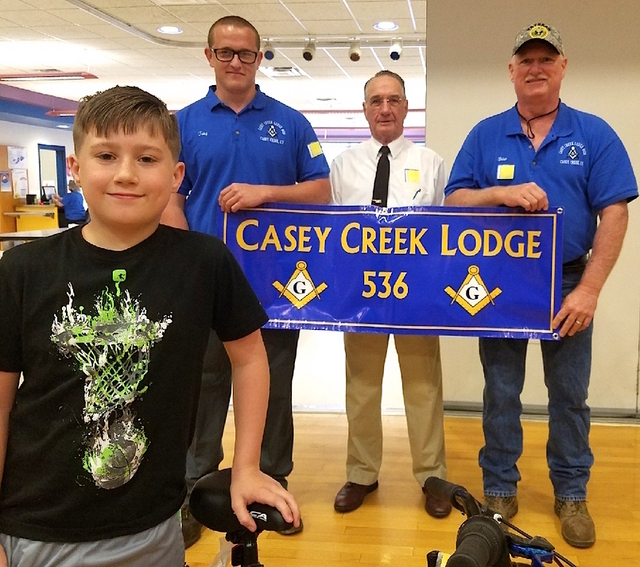 Casey Creek Lodge #536 F. & A. M. presented two bicycles to the winners for perfect attendance at Adair County Elementary School for the Spring Semester on May 24, 2018. The winners were Hayley Parnell and Bryson Adams. Representing Casey Creek Lodge were Tony Gabehart-Junior Steward, Marvin Martin-Junior Warden, and Brian DeWitt-Senior Warden. 2018-06-08 - Adair County Elementary School (ACES), 870 Indian Drive, Columbia, KY - Photo by Carper D. Hayes, Master, Casey Creek Lodge #536 F. & A.M..
Casey Creek Lodge #536 F. & A. M. presented two bicycles to the winners for perfect attendance at Adair County Elementary School for the Spring Semester on May 24, 2018, above to Bryson Adams. Representing Casey Creek Lodge, looking on, were Tony Gabehart-Junior Steward, Marvin Martin-Junior Warden, and Brian DeWitt-Senior Warden. 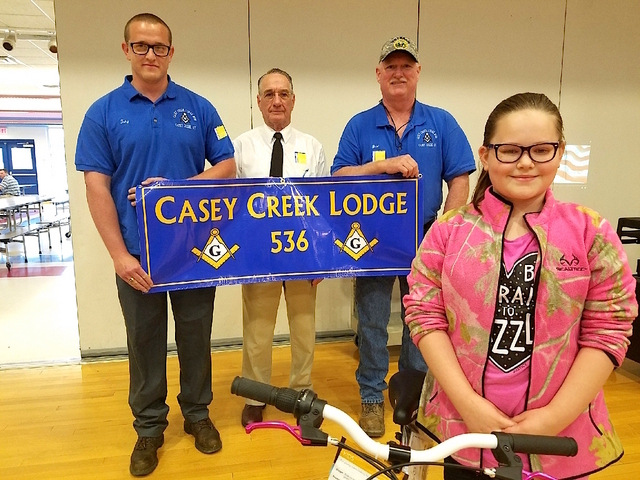 Casey Creek Lodge #536 F. & A. M. presented two bicycles to the winners for perfect attendance at Adair County Elementary School for the Spring Semester on May 24, 2018, above to Hayley Parnell. Representing Casey Creek Lodge, looking on, were Tony Gabehart-Junior Steward, Marvin Martin-Junior Warden, and Brian DeWitt-Senior Warden. - CARPER D. HAYES, Master.